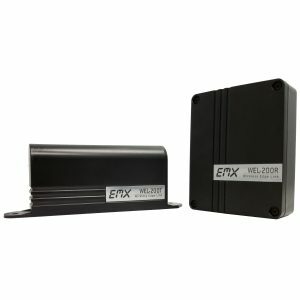 The WEL-200 system by EMX Industries provides a complete wireless solution for interfacing sensing edges with gate and door operators. The Wireless Edge Link eliminates the wiring between the safety edge and operator control box reducing labor and material costs. Compliant with 2016 UL325 standards, the WEL-200 is compatible with NC, 10K and pulse monitoring. The WEL operates at up to 200 ft. between transmitter and receiver. The transmitter is battery powered and compatible with both 8.2K and 10K monitored safety edges. The receiver connects with up to four transmitters with separate relay and pulse outputs for open and close edge functionality. The WEL-200R is NEMA 4X allowing for easy, reliable outdoor installation. Featuring an integrated antenna, the receiver offers flexible mounting options outside the operator for maximum performance.